In Winkleman Gallery’s darkened space, Leslie Thornton’s Binocular works are shifting and pulsing. The series, consisting of flat-screen monitors and one projection, was created using animal footage that was shot and reimagined by Thornton, a long time experimental filmmaker. The works are hypnotizing meditations on the relationship between nature and technology. Each of the Binocular works consist of two circles on a flat-screen monitor. 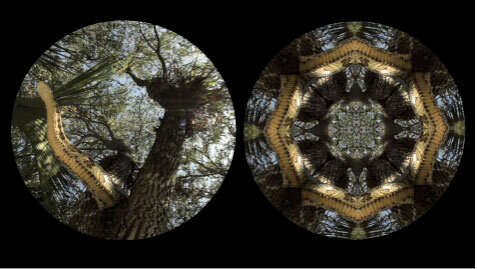 The left circle features footage of an animal in the wild – for example a zebra standing in a field – and in the right circle, the same image is folded in on itself, creating a kaleidoscopic abstraction that moves in time with its corresponding left image. Playing with video editing software, Thornton enriches our reading of the figurative images on the left through the beautiful, transfixing visuals on the right. By manipulating the footage, we are able to notice things about the animals’ natural behaviors and appearances that the unedited footage might not reveal. Though the idea that beauty and mystery exists foremost in nature might seem like an old hat, Thornton’s pragmatic handling of this notion and her skill in creating absorbing, intense, and progressive imagery results in works that feel anything but hackneyed. In one of the pieces, a venomous python perches on a tree, mostly idling. When it does move, the right circle comes alive as the various white/yellow tones of its scales slide and twist against one another. Its eyes, multiplied by the kaleidoscopic effect, slowly blink against the slippery whites of its body and dense greens of the tree. Since the movement is not constant, the quiet grace and naturally graphic beauty of the animal is dramatically intensified by the details of the manipulated image. Another piece in the show produces a very different effect. In the left circle, ants move busily in and out of their mound, crawling over one another in a chaotic dance. Unlike the snake, with its slow, purposeful shifts and blinks, the fast pace of the ants causes a perpetual explosion of color and movement in the right circle. In these two examples we witness Thornton’s instincts and focus at work. For each of the pieces in the show, she came up with unique manipulations in order to properly echo but not emulate the original footage. The mathematical splitting of the snake’s image accentuates the compressed, heavy quality of its form, while the formula for the ants exaggerates their hyperactivity. It’s a simple idea with a complex execution, and the works seem to match – and sometimes exceed – the beauty of their subjects. There is a refreshing idealism to the Binocular series. While the process is sophisticated, the viewer doesn’t feel challenged – Thornton managed to aggressively embrace technology without it feel pushy. Instead, the glowing monitors quietly welcome us into a concentrated celebration of nature’s visual wonders. Leslie Thornton, Binocular, installation view. Photograph by Etienne Frossard.